A salad so beautiful, you’ll barely want to eat it! 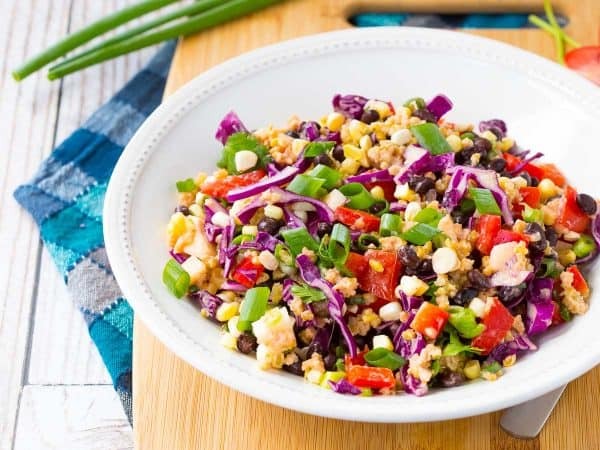 But you’ll definitely want to because this southwestern chopped salad is full of flavor thanks to an easy to make dressing and tons of great vegetables. 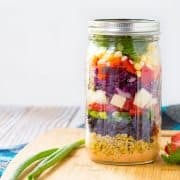 Beautiful layers of flavor and nutrition make this mason jar salad a meal prep dream come true! You’ll look forward to this vegetarian southwestern chopped salad waiting for you in your fridge. 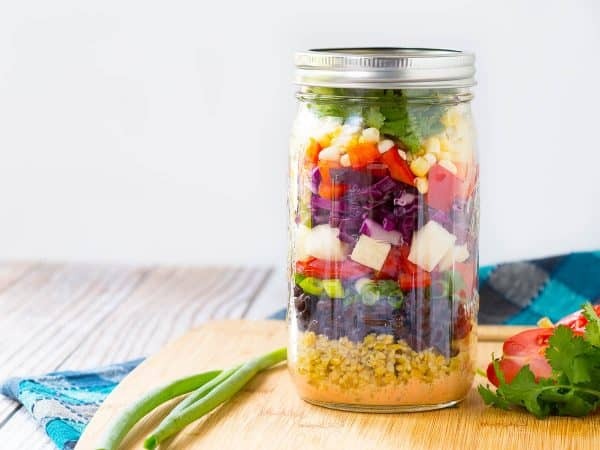 Mason jar salads are all the rage lately, and for good reason! The dressing waiting at the bottom is kept separate from the other ingredients, preventing the horrors of a soggy salad. 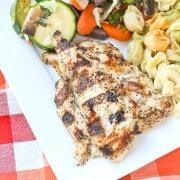 They are perfect for meal prep on the weekend and easy weekday meals, all ready to go with no soggy salad. Have you tried my caprese zucchini noodle and farro mason jar salad? Try it with that basil in your garden you need to use! Let’s talk about the dressing on this salad for a minute. All you need are two simple ingredients, Rachel Cooks partner Old El Paso‘s enchilada sauce and Greek yogurt. 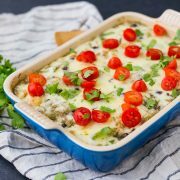 It’s full of flavor thanks to the enchilada sauce (you can use mild or medium, whatever you prefer) and the yogurt makes it so creamy. 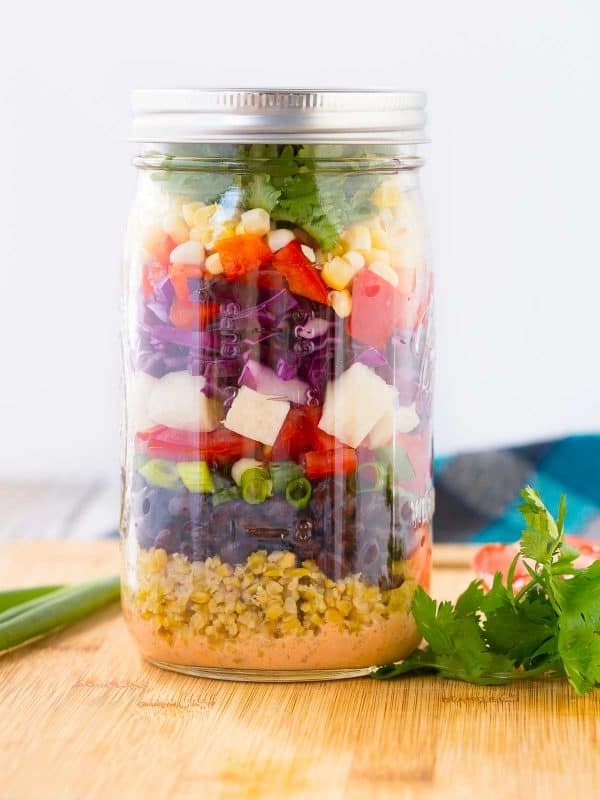 Layered on top of the dressing in the mason jar is your favorite grain. I used freekeh in mine, but quinoa would be amazing and brown rice would be fantastic too. 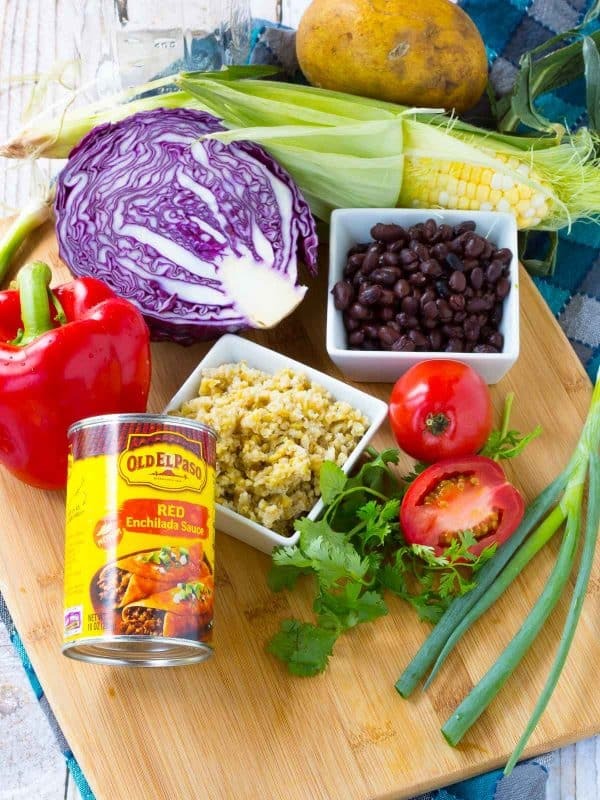 On top of the grain, add black beans – they provide protein so you’ll be full all afternoon. Lastly are all the beautiful vegetables. I used green onions, tomato, jicama, red cabbage, bell peppers, corn and cilantro. When you’re ready to eat, you just need to dump it in a bowl and mix in the dressing. This southwestern chopped salad has an easy dressing and tons of vegetables – it’s almost too pretty to eat. ALMOST. But it’s worth every beautiful bite. In a small bowl or measuring cup, whisk together Old El Paso Red Enchilada Sauce and Greek yogurt until combined. Place 3 tablespoons of dressing in the bottom of a mason jar. Follow with your favorite grain (freekeh is pictured, but quinoa or rice would be great too – choose what fits your personal needs/tastes). Follow with remaining ingredients, creating beautiful layers. 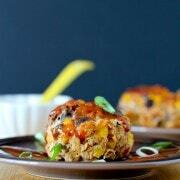 Place in fridge until ready to serve, or up to 3-4 days depending on freshness of the produce used. When ready to serve, pour into a bowl and mix to combine dressing. Note: This is a very flexible recipe – if you can’t find all the vegetables, it will still be great. I recommend definitely using red cabbage for its terrific crunch though. Note: This is a great recipe for meal prep on the weekends – the salad keeps great in the fridge due to the layering. Verdict: Loved this salad – it was the perfect vegetarian salad – so filling and flavorful. Husband’s take: Ben is gone Monday-Thursday every week for work right now so he hasn’t yet had the opportunity to try this. Changes I would make: None are necessary but as I mention in the notes of the recipe, feel free to customize the vegetables and the grains to suit your tastes, what is in your fridge, or what is in season. This was delicious. I made several for the week! The dressing would also be good just as a veggie dip for zucchini, carrots, whatever. I used a different combination of vegetables then was listed, but I agree almost anything could be used. Thanks! Going to try this today. I love healthy. I adore mason jar salads, and the colors and flavors in this one are to die for! <3 Can't wait to put this one in the fridge! I love the idea of this salad packed and ready to go like this!! It’s perfect for meal prep! Awesome idea and love the colors!! Aren’t the colors beautiful? Thanks Gerry! LOVE this easy dressing AND amazing salad! I am all in for this gorgeous salad! Two ingredient dressing – yes, please! I’m all for easy salad dressings! This is such a genius idea! And I LOVE Old El Paso enchilada sauce, I have some in my pantry right now! I lovelovelove southwestern salads! The fact that this is in a mason jar? EVEN BETTER! I’ve been trying to do better about eating healthy lunches (with REAL food!) and this is definitely going on the list! Love that I can prep it ahead.